The Chrysocolla has a curious name and dazzling appearance. It is a gem that intrigues and enchants by its physical and mystical attributes. The crystal, identified by a mixture of green, vibrant blue and some brownish traces, is found in greater abundance in the deposits located in Peru, Chile, Brazil, Bolivia and also in the Democratic Republic of Congo. Of Greek origin, this stone is the result of the junction of two words: chrysos and kolla that mean, respectively, gold and glue. Such a denomination comes because the material has been constantly used to solder the gold. Not only is this a powerful crystal associated with healing characteristics, wisdom and emotional balance, being used by many civilizations over the centuries. In addition to the Greeks, ancient Egyptians, Incas, and even American Indians made use of this gem for innumerable purposes of physical, emotional and spiritual. Endowed with an enormous shamanic power, the stone is closely linked to the feminine Yin energy as well as to the cycles of the woman. This characteristic helps the one who bears it to have a greater fluidity and physical, emotional and spiritual level. By the ancient Incas, the chrysocolla was intensely used in jewelry. The Egyptians called it the “stone of wisdom”, associated with its ability to provide more sensitivity and tolerance to its bearers. However, it was among the American Indians that its use was even more widespread, that they had it as a way of increasing the resistance of their bodies. Other attributions given to it include the feeling of calm in face of stress and emotional disturbances. Regardless of the time when this stone was used, some of its characteristics passed unanimously among all peoples. In general, it is considered as the stone of communication, wisdom, and prosperity, offering on an immense range of benefits to the one who has it close by. In addition to its feminine characteristic, the crystal has other connections, including two chakras: the Anahata, the fourth chakra, located in the heart area; and Visuddha, the fifth chakra of the throat. Its properties are also able to calm all the other chakras, besides opening the third sight when it is placed on the frontal chakra – favoring meditation. 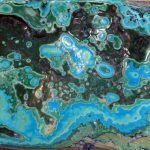 The chrysocolla is one of the stones that symbolize the Sagittarius sign and can be used as an amulet by people born in this period. In Feng Shui, this crystal has greater functionality in the east and southwest sectors of the house. To achieve the desired effects, this crystal should be used close to the body, in direct contact with the skin, preferably in some accessory such as necklaces, bracelets, earrings or rings. However, if the intention is to eliminate negative energies from environments, distress leaves the exposed stone where it wants it to absorb and purify.